The Mayan hammock is arguably the most comfortable gathered-end hammock available anywhere, and is notable for being the descendent of the original hammock discovered by Columbus on his voyages to the West Indies. 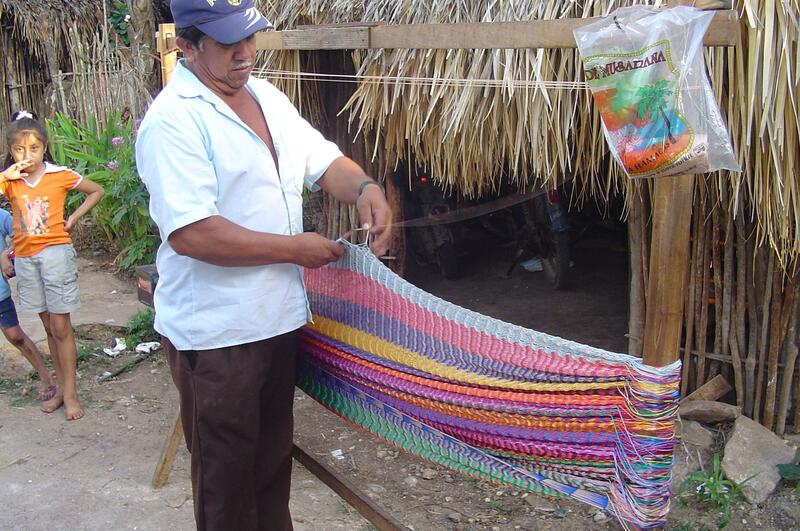 The Mayan hammock is woven using a fairly tight “triple weave” that creates a lattice when pulled apart. Mayan hammocks tend to be heavy, due to the quantity of string used to create the netting, so this style of hammock is more suitable for sleeping indoors than lightweight backpacking. Much depends on the type and quantity of string used and what size hammock you weave. I found that the Mayan weaving style is not terribly difficult, but it does take patience and a little time. Once you get the weaving pattern down, expect to spend a few weeks to complete the weaving, depending on how much time per day you can devote to weaving and how big you want the bed. > 2,000 yards (~1,860 m) of #18 twisted cotton or nylon string for a hammock bed approximately 72 × 50 in (183 × 127 cm). Nylon is more mildew resistant, but cotton will be more comfortable. The clew or end strings, are each half the length of the hammock, effectively doubling the overall length of the hammock. A netting needle (“lanzadera” or shuttle) is used to load a quantity of string and work it through the warp to create the weave. 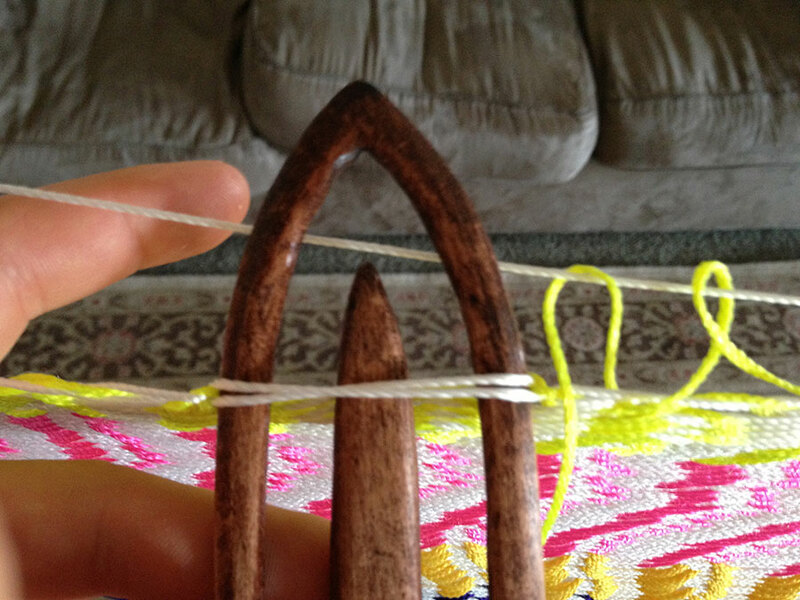 A netting needle differs from a traditional loom shuttle in that the one end is pointed or tapered, making it easier to poke the shuttle through the weave. These needles are traditionally used for making fishing nets and are still used today to make Mayan hammocks. You can make your own needle or purchase one. A basic loom measures 6 ft (1.8 m) tall by 6.5 ft (2 m) wide when assembled and consists of two vertical posts or poles and two horizontal beams. Most looms are adjustable via notches in the horizontal beams and holes in the vertical posts so the weaver can make slightly longer hammock beds. These horizontal supports are secured with a wedge so the hammock body can be removed (slid upward) off the frame when the weaving is complete. You can make a basic, inexpensive frame out of PVC pipe or lumber. To make a traditional stand, you’ll need to cut and assemble the wood poles and beams, including wedges, to make the stand sturdy and long-lasting. Once the loom is built and in place it is time to load the loom with the “warp” string. 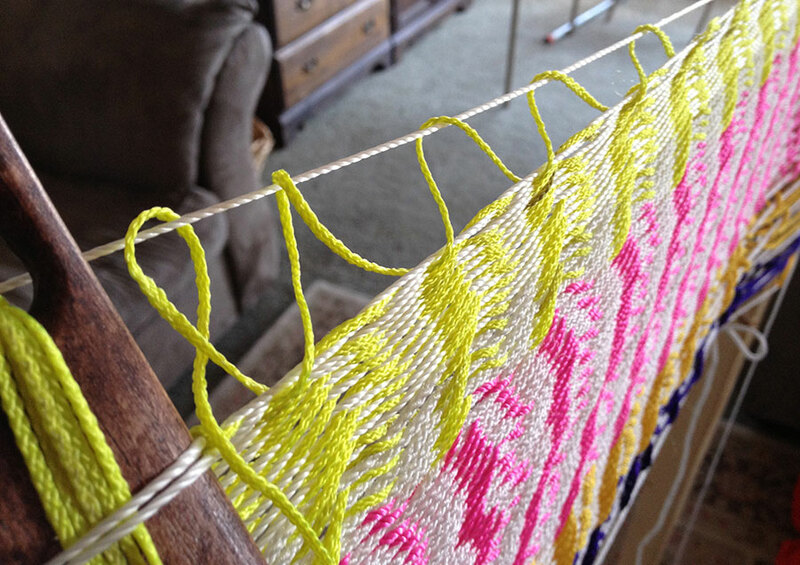 Begin by tying the warp string to the top of one vertical post and then wrap it around the second post until you wind a sufficient number of strings between the two posts. The number of warp strings depends on the color patterns you intend to weave. You can easily add more warp string as you go along, allowing for color variations on the project, even alternating between the warp and weft strands. Once loaded, tie the standing end back to one of the loom’s vertical posts. A netting needle can handle only so much string before it’s full, so having a few on hand is a good idea if you want to keep weaving without interruption. 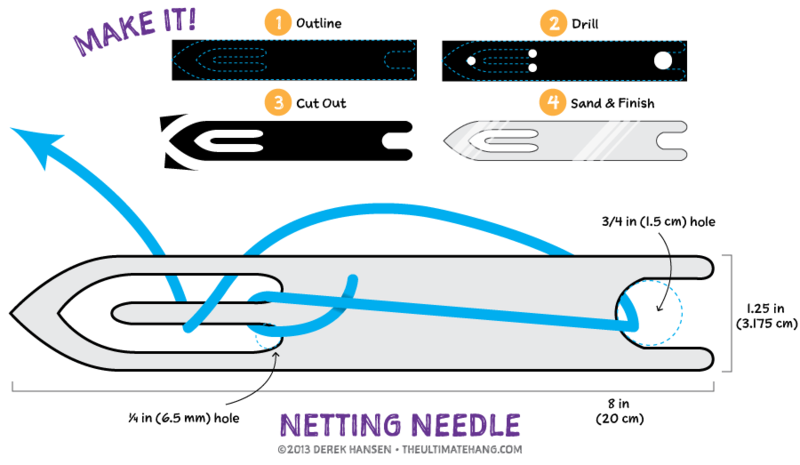 Hitch the end of the string (ABOK #1602) around the needle and then begin to wrap around the bottom of the netting needle and back to the top where you wrap the needle again. Repeat this back-and-forth process until the shuttle is full (see shuttle image above). A few sources refer to the edge as “crochet,” which it might be, but it’s nothing more than a series of overhand knots (ABOK #46) evenly spaced along the edge. This is the first task in the weaving process. There should be a minimum of 21 knots, making 20 spaced sections. The knots should be spaced between 3 and 4 inches (8 and 10 cm) apart. There should be a minimum of 4 rows of interlaced knot rows and as many as 8 or 10. This edging sets the spacing for the weaving along with providing a tight edge to maintain the hammock shape. First row: Loop around the bottom (first) warp from the back, then around and back behind the second and first warp, capturing the working weft as well. Subsequent rows: Loop around a knot then go up, capturing a new warp line, then back around to the first line and knot. There should be 2 weaves on each of the 20 spaced sections, creating 40 weaves across the hammock body. Where the weft dips down, pull the two warp strands and insert the shuttle. 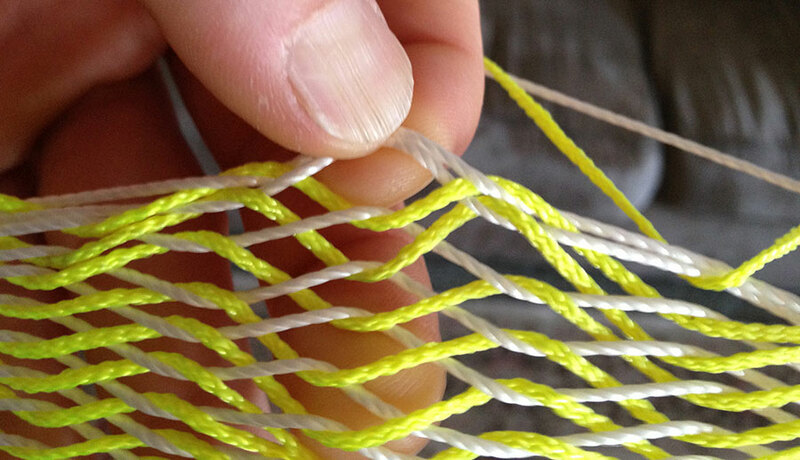 As you work along the warp, keep the weft string tight to ensure the lattice isn’t loose when you’re done. When you reach the end, go around the pole and hitch the weft and warp strings you were just working on and then continue the pattern. …and then back around to the front to end the weave cycle. You can see from this loosened weave the undulating pattern created in the weave. NOTE: Never end a string in the middle of the hammock. If you run out of string, tie it off on the pole and begin a new string. Do not tie knots or leave loose strands in the middle of the hammock. High-quality Mayan hammocks have at least 40 rows of weft that is woven through the warp, leaving a tightly-woven net that flexes and supports the occupant unlike any other hammock available. This video (above) actually does a great job in showing the mechanics of making the clew. The clew is a modern sailor term for the nettles or string that attaches to the ends of the hammock and provides a loop or ring as the attachment point. The nettles should be half the length of the hammock, effectively doubling the overall size of the hammock (for example, a hammock body 2 m (6.5 ft) long, the nettles should be 1 m (3.25 ft) long each). The nettles should all be the same length. Traditionally, the nettles are made from a single, continuous strand of #18 twisted nylon string that is looped around 6 sections from the hammock body. The nettles are middled to create a bight. This bight is tied and then cockscombed to protect the nettles. 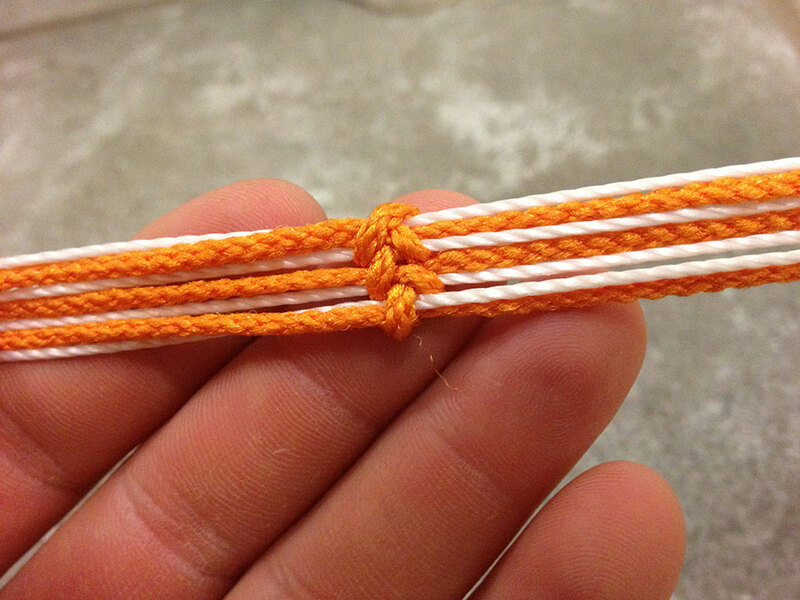 The two remaining ends are tied on to themselves using a French Spiral Hitch/Whipping (ABOK #3450). Alternatively, you can tie a Shouldered Sword Mat (ABOK #3819) with the two remaining ends to create a navy-style clew. How would you change the color of the string during the triple weave? 1. Use multiple shuttles/netting needles. In the photo (above) you can see contrasting colors interwoven with the main color. For example, the red section punctuated with four rows of cyan/blue. To do this, the loom is wrapped with red yarn (primary color) and you alternate between two shuttles, one with red and the other with cyan (secondary/highlight color). After four weaves of one color, you set that shuttle down (the yarn is still attached), and begin weaving with the other shuttle. Continue alternating. If you run out of a color before the pattern is complete, fill the shuttle with yarn and tie the yarn from the shuttle to the end of the weaving yarn you just finished. I use a double fisherman’s knot to connect the yarns. Make sure your knots occur at the ends of the hammock, not in the body itself. 2. 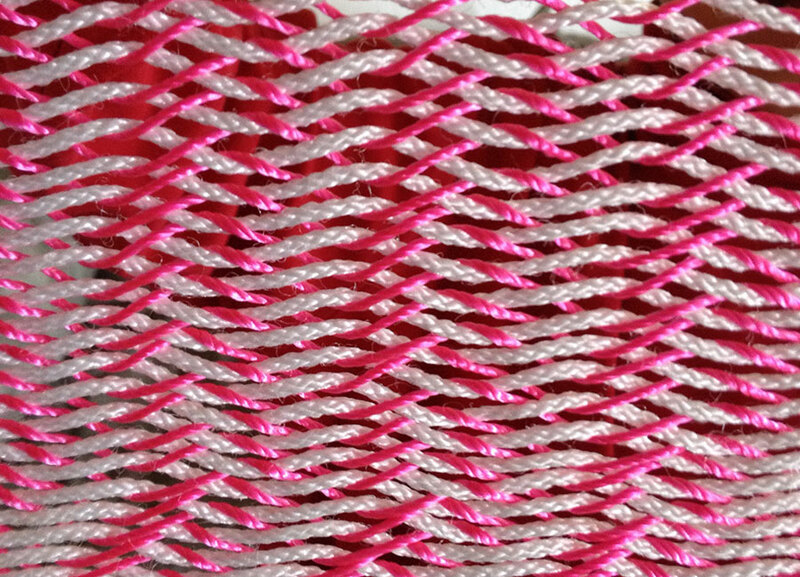 Fill warp and weft strands to set amounts. After finishing a few rows, I found that I could fill a shuttle with enough yarn for about 1 in (2.5 cm) of completed weaving. It worked out to about 10 warp strands around the loom. When I wanted to change the pattern, I would wrap 10 strands around the loom and then weave with the shuttle. My shuttle would just about run out after weaving down those 10 warp strands. At this point I could switch colors both on the loom (warp strands) and the shuttle (weft strands) as I wanted/needed. 3. Keep the spool of warp yarn attached to the loom as you would a sewing machine. I’ve done a few sections where the warp strands around the loom continued for a while, even though I was alternating the weaving/weft strands. Instead of wrapping dozens of strands of yarn around the loom, I would only do about 10 and then stick the remaining spool of yarn on the top of my loop (secured with a rubber band). In this way, I could wrap the loom again without tying any more knots for the warp strands. Let me know if this makes sense and if you have further questions. My last question is did you use a thousand yards or thousand feet? 1,000 yds (915 m) will get you a hammock bed about 50 in (1.27 m) wide and 6.5 ft (2 m) long. Add a little more for the nettles which will double the overall length of the hammock. Then i guess that leads to my next question of, where did you get rope for this? For the hammock I’m making now, I purchased the yarn from hobby lobby. They had an assortment of colors of #18 nylon from the brand “Artiste”. Each spool was 197 yds (180 m). I got 6 of them. I also purchased a spool of white #18 nylon string from Home Depot, 1,000 yards (I think) of mason line. It was pretty cheap. I’m still trying to find a good source for the cotton yarn. When I find a good source for a good price I’ll post it. Correction: my earlier estimates only counted the wrapped yarn, not the weft or woven yarn. You’ll need about double the amount of string, or roughly 2,000 yards (1,830 m) for a hammock bed about 50 inches (1.25 m). Do you have a source for the #18 cotton cord in different colors? I’d like to make one for my daughter but can’t find the cord. Lori, I wish I was better at understanding yarn and string. I exchanged samples with a yarn maker out of Kansas for weeks and it is still confusing to me :} I was searching online today looking for some samples that might work, but I can’t be 100% sure. This string looks pretty good. A friend sent me several cones of yarn from Mexico that is labeled to be “good for hammocks and weaving” so I’m giving it a try on my loom. It is a “No. 6 100% Nylon”. It is smaller than the #18 I used on my last hammock. I’d like to do something thicker, and in cotton, but I still haven’t found a good source. I actually have samples coming from a cotton yarn Mfg. Their minimum order is like 900 lbs. LOLO but they offered to hook me up with a customer of theirs who would ship smaller quantities. I’ll keep you updated when they arrive. How is the finishing edge or crochet done? The edging is the same on both sides. You’ll need to lay out a few wraps of warp string to match the beginning edge and then begin the knotting process. 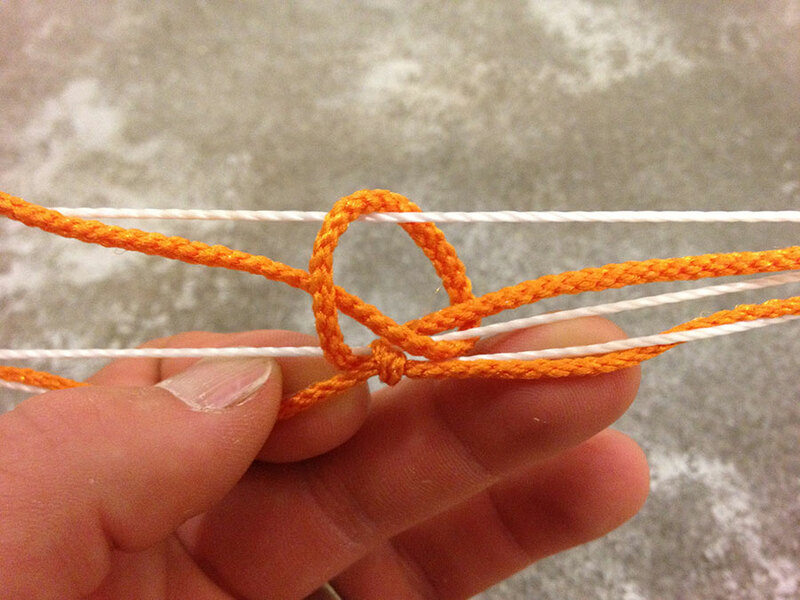 Skip every two weaves and tie an overhand knot and layer those knots as you did in the beginning. Yes, although it is a repeat of the beginning edge, which is already on the video. 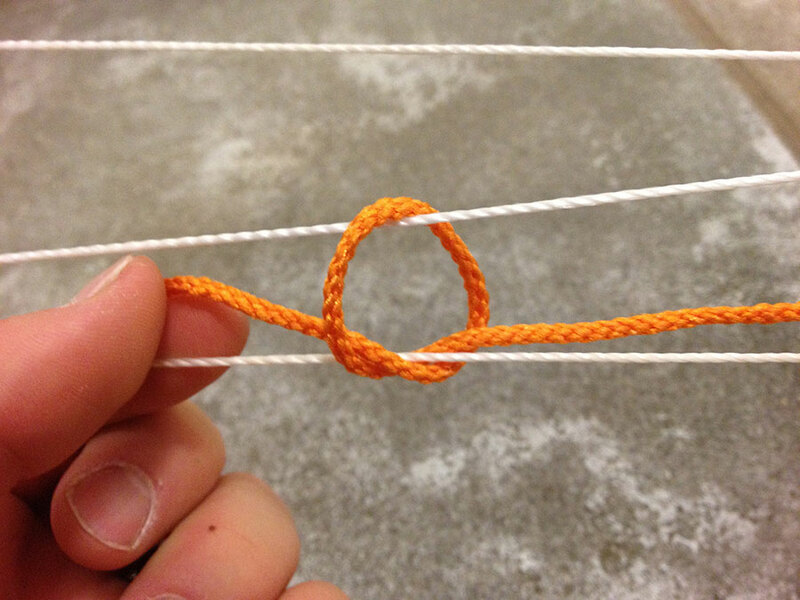 It is the same pattern: skip two and tie a half hitch. Hi! I followed your instructions and built a mayan loom and attempted a baby sized hammock. However, when I finished and took the hammock off the loom, the weave stretched out and made a mess. I don’t think I am finishing the rows up correctly when I reach a pole. 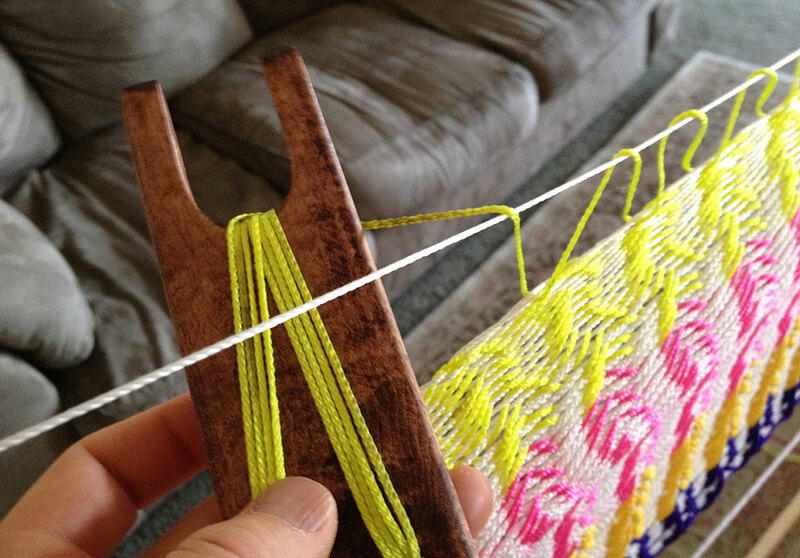 What do you mean by “hitch the weft and warp strings you were just working on…”? Currently, when I reach a pole, I just wrap the weft around it and continue weaving. Over time, the undulating weft pattern near the poles start creeping inwards towards the center of the hammock. So I am pretty sure I am not doing it correctly. Are you tying off each row to the pole? My hammock does not scrunch back up all by itself when it is off the loom and in my hands. Thanks so much for your instructions and your help! Adam, I also replied to you personally, but for the benefit of the community, I’m realizing there are a few idiosyncrasies that I need to address, possibly in a new video. When you finish a row of weaving and bring the shuttle around the pole, you first hook this line (hitch it) with the same working line from the shuttle. After this first hitch, you then begin the triple weave. The way you fill the loom is important. The line you are weaving (the top line that you go “over and around” with the shuttle) should be opposite you on the loom. The working line from the shuttle should be nearest you on the loom. When you wrap the loom and begin weaving, you should follow this pattern. The warp string should be on the opposite side of the loom. Soooooo, if one inch has about 10 warp strings, then a 50″ wide hammock has about 500 warp strings in total? Wow! Much depends on the thickness of the yarn you use. In my own testing, I had some rows with 12 to an inch. If I haven’t already stated, let it be known that I’m not a weaving expert 🙂 Every time I spoke with the Yarn Barn in Kansas about yarn, I got confused about how they measure yarn thickness. It was maddening. I finally admitted that I have no desire to be an expert on weaving, but it was a lot of fun to make the weave and the hammock. So, as long as nobody asks me specific questions about the best yarn (I’ll leave that to the experts) I’m happy to entertain questions on how to weave the mayan hammock. That part I have down pat. Hola Derek, Thank you for this informative tutorial. I’m confident about the entire process short of the clew, is a separate jig used for this process? You could use a jig. The “pros” just wrap it around their legs, with the bight or center of the nettles between their legs as they get it folded up. I used a make-shift jig so I could get the nettles all the same length (two poles: one to hold the hammock in a line and the other used to wrap around). Once the nettles are all wrapped through and sized correctly, the whipping is easy. I first make the bight and whip the nettles together. Next, I “frap” the whipping or wrapping so it is properly seized. The frap goes around the whipping, through the eye and down to the nettles and back a few times. Finally, I do a simple cockscombing around the eye. 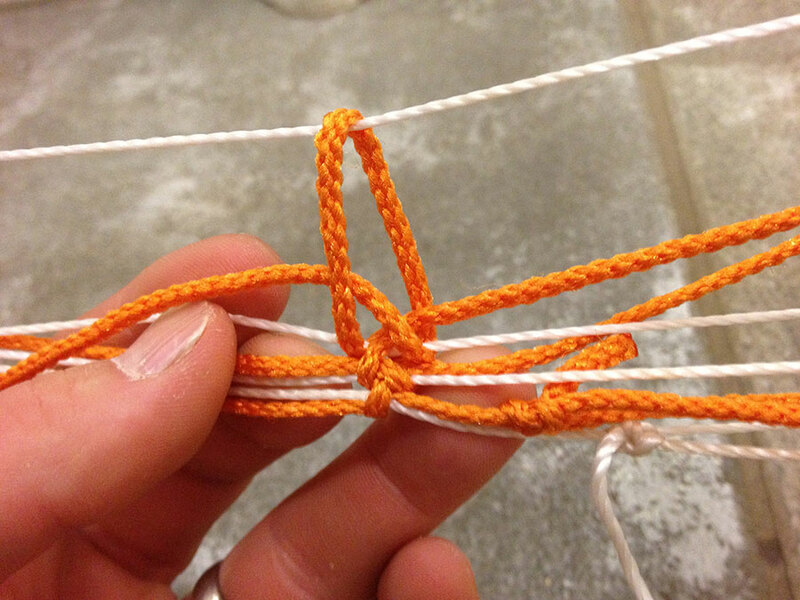 There are several methods you can use, including a basic half hitch. Great video! I can’t wait to try it. I feel like I’m missing something though – your warp (the white strings?) seems to be twisted and thinner than your weft (do I have that right? ), which seems to be thicker and braided. Should these be different thicknesses, or could one just go with the same line for everything? Same line thickness for everything. In the video I tried to use contrasting colors for better visibility. Let me know what step you need help on. Did the illustration and video make sense? I’m very thankful for your video as I have been trying to find the legit way of making a Mayan Hammock for quite some time now. I do have a few questions before I begin. What kind of knot do you tie the warp to the loom with? Can your warp be more than one strand and if so how do I add on more warp? And how do I add the clew to the hammock body? I hope to hear from you soon! Thank You! Also how do add the nettles? Hey Matt! It might be faster to talk over the phone. You game? Send me a PM. The actual size of #18 mason line is very thin compared to the nylon string used in the pictures and the videos posted on this page. Is it a thicker nylon being used? Or a different brand or braid? Some of the demo photos used in this post were made with thicker string, but the final hammocks I made were with #18 line, as that matched the original Mayan hammock I purchased. Does it matter from which side you start warping the loom? Do you just wind the warp thread in a circular pattern or is there a figure 8 pattern used? Do you start the warp at the bottom and then go towards the top of the loom with it? It doesn’t matter which side you start, but start from the bottom and wind up in a circular pattern. So in whatever direction you load the loom right to left or left to right tying the edge knots AND weaving continue in the same direction. Me edges look like hell I am missing something. Do you always finish an “under two over and around one” repeat? clarification on the edges if you could! Thanks. I just wanted to tell a little secret to the Mayan hammock that very few of us know about. 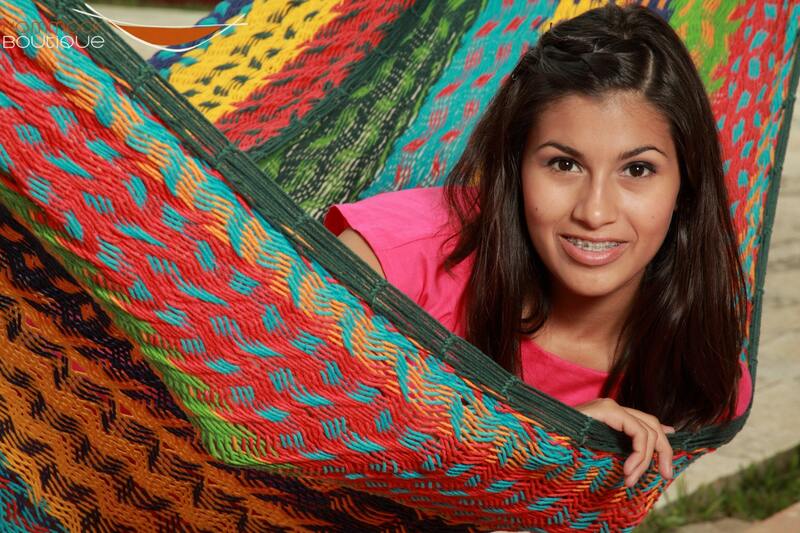 This hammock is made according to an old mayan tradition in ancient times when labor was not valuable. Nowadays, the people who make those hammocks are still respecting that old tradition and make hammocks at home for their pleasure and not for a money living. The real mayan hammock is not worth making it for money. The small hammocks made of thick rope sold to the tourists on the beaches of the mayan Riviera are about the only ones who provide money for the producers. But they are too small. Some smart businessman (who weren’t aware of this tradition) took this hammock to India and China in order to copy it and find a better price. That was a big mistake, and they have lost a long time for this quest, and were rewarded by mayan time, worth nothing !!!! I have made myself a Mayan hammock with 4 strings stiches and I guess I will never do one again. I failed for making the arms and bringed it to some mayan experts do it again for me. Here you can see some pictures http://www.tropical-hamac.com/blog/cours-de-tissage-du-hamac-mexicain/ and read some french !! Que les vayan muy bien. how many warp strings should there be? For a full hammock? That depends on the size of string you are using (how many weaves equal an inch is variable) and how wide you want the hammock. I cannot answer exactly, but I will say that once you start weaving you can make an easy calculation based on how many weaves equal an inch. The video for the clew seems to be down, unfortunately…is there another source, a similar video, or a set of instructions you’d suggest in its place? Hmm. Unfortunate. That wasn’t my video, and it didn’t show a lot, but it was helpful. I’ll have to make a short video myself. Stay tuned. The process is pretty straightforward: set up a jig with two, 60 cm-long dowels separated about 1 m (or about half the length of your hammock). Take about 7 loops from the end of the hammock and loop them over one dowel and gather them up with your clew string and tie off a series of half hitches or a bowline. Wrap the clew line around the second dowel and back down to repeat the process. 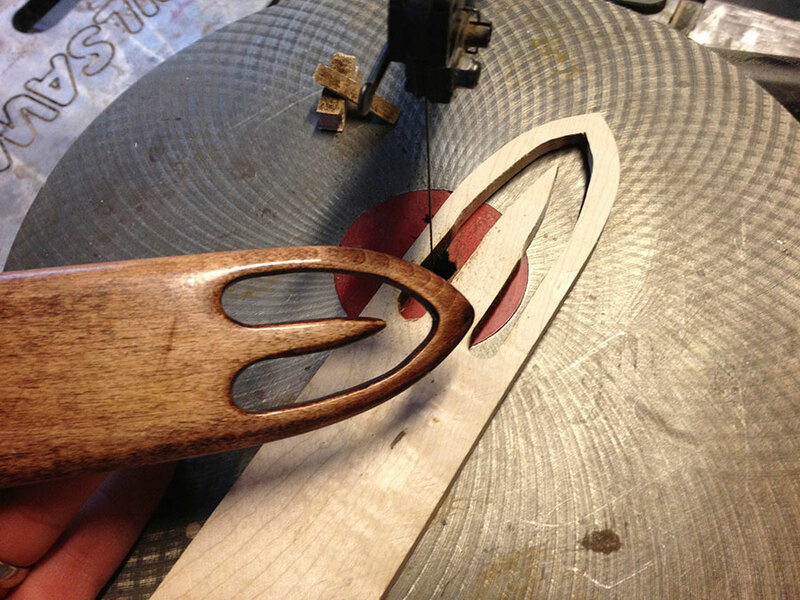 Using this jig helps to keep the clew length the same across the entire hammock while tensioning the ends. 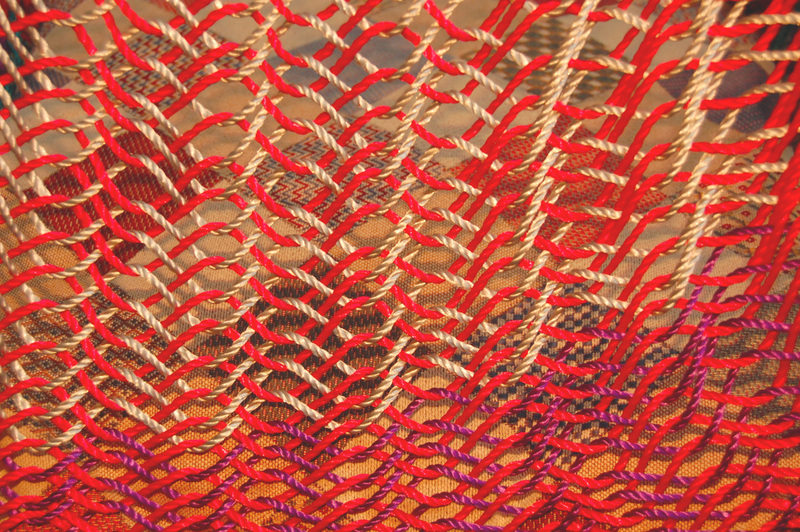 Once all the loops on the hammock are collected and run through the clew string and tied off, you can gather up the bight loop on the end of the clew and whip it and then wrap it with any number of cockscombing techniques. still waiting for that new video you wanted to make!!! First of all, thanks for such awesome instructions on the Mayan hammock. I’m about 25% through my first hammock and things are going pretty well, however I have a question: When finishing a line of weave and you are ready to wrap around the post, what’s the best knot/stitch to tie before heading back for the next line of weave? The reason I ask is that I sometimes encounter an uneven edge at the ends of my hammock bed. Oh, and I just thought of another minor question: is it possible to make your weave too tight? I usually alternate colors and leave the shuttle loaded. I reload the shuttle at the end and tie a double fisherman knot to connect more string and then load the shuttle up again. I hope that helps. The weave shouldn’t be too tight. That could make the hammock too tight. I am totally blown away by the art! I am a complete novice to the art, although, I have been swinging a lifetime. Please help me get started. Not having any real weaving experience it seems a bit challenging, but not unattainable to learn. Does your book provide a detailed step by step? – for dummies. If we could discuss some of the initial steps you took to learn the craft, I would be greatful. Have you made an instructional video that details the building of the loom as well as the weaving techniques? Please help me learn this amazing art. I’d love to teach my three daughters as I learn the craft. Thank you!! Thanks Justin. Have you seen the video attached to this post? It goes through most of the weaving process. I didn’t make a video of building the loom, but hopefully the photos are enough. It’s pretty basic. If I were to do it again, I would round the vertical posts or even use rounded hand rail stock to make it easier to put everything together. My current book does not show how to make hammocks, but I’m working on a second edition, due later this summer, that will have detailed instructions on this and many other hammocks. Send me an email if you have any specific questions that aren’t covered in the post. Ok great. I did watch the video. I think I’ll start with building the loom from the diagrams on the site. Once the loom is constructed and I have that as a visual guide, I can then begin to understand the process better. The amount of warp lines are based on the amount of different colors I intend to use? Are two warp lines used per color? Also, when sourcing materials for the weave – do you have any that you could recommend? Thank you for your quick response. Hi Derek. Thank you so much for providing this information! I am wondering if you can tell me exactly how far apart the vertical beams are on the loom. 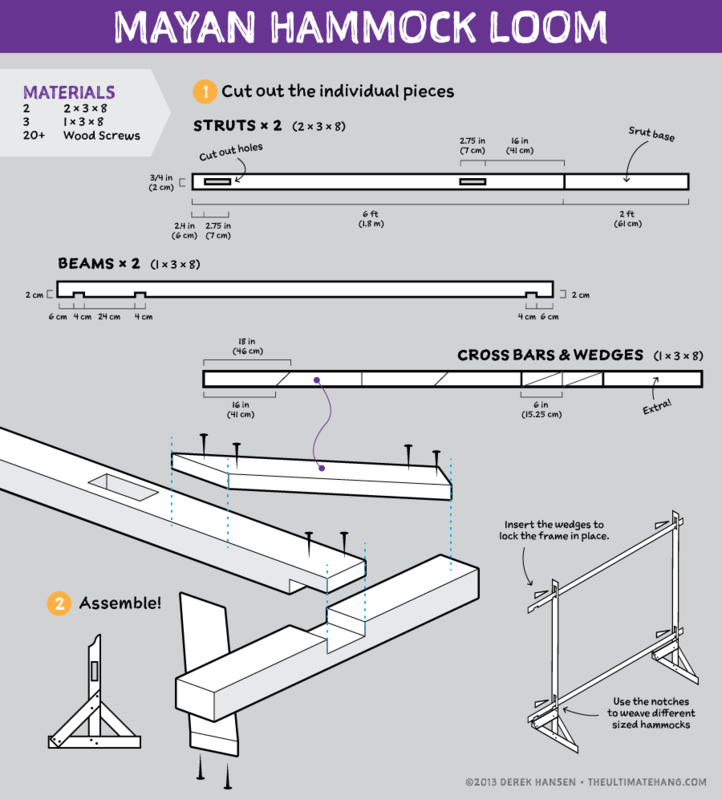 My back patio actually has some very substantial beams that are 104.5″ apart (the beams themselves are about 3.5″ thick) that I’m wondering if I can use instead of the loom. Do you think they’ll work? P.S. I’m so happy you’re working on a book about making hammocks! I keep (half) joking with my husband that he needs to take me to Nicaragua to find someone to teach me their weave 🙂 Are you including Brazilian and Nicaraguan styles? Most Mayan-style hammocks are roughly 2 meters long in the body. The clews, or end strings, are each a half length of the body, so the full length of the hammock is roughly 4 meters long. Your beams are spaced about perfectly for the hammock loom. I will say that one thing I wish I had was rounder, smoother beams on the loom. After I complete the hammock I’m weaving, I hope to sand down or replace the means with a round post, maybe use a handrail. Yes, my new book will contain instructions on making several hammocks styles, along with updated information from the first edition and more. It’s a big work in progress. I will include information on a Brazilian style hammock, but there isn’t much too them, unless you want to get technical about weaving them—you’d need a pretty serious loom because Brazilian hammocks are more cloth or fabric based. They add decorative trim or macrame on the edges, but I’m not going to explain how to crochet in my book 🙂 Nicaraguan hammocks are identical to Brazilian except that they most often have spreader bars on the ends. If you really want to learn to weave, it’s the Mayan triple weave that’s most interesting to learn, and for that you should go to the capital of Yucatán, Mérida. This is where the weaving center is located. I’m personally using a frame I put together out of PVC pipes. It’s easy to take apart when I’m done, and easy to store, and a good alternative if building a wooden frame isn’t practical. Good luck with your hammock! You have to be able to take the loom apart in order to slide the hammock from off the uprights. You will have to take your roof off the porch to get the hammock off. What is the thickness of the cord you used? This is actually something I struggle with. I don’t know well enough the way to measure them. I used 18 gauge mason line and that seemed as good as what’s used. What weavers, knitters, and other fiber artists usually do is wrap it around a ruler and count wraps per inch. I am really excited to try. I feel like there are a couple steps missing at the beginning and end that I might need more clarification on. Would you mind if I reached out to you? I am making the hammock for sentimental reasons for my parents as a surprise because we always grew up with them from my grandpas house in mexico. Ours looked like this put were made with rolled cotton fabric. Do you have any idea what that might have been? Please email me directly with questions. By rolled cotton fabric, do you mean the string? I am so excited to try this! Do you know if this hammock wood be large/strong enough to hold two people? Also, do you have any tips on how to create a loom out of PVC pipe? Yes, the hammock can hold 2+ people, depending on the strength of the string you use. A PVC loom would be easy enough with the right elbow and T-joints. That size will work. Still, you can choose what works best for you. The most comfy weaves use a thick cotton thread. Harder to find but feels good. Hey! I’m currently constructing a Mayan hammock based on your instructions. I went with a 7′ loom (I’m 6’3″). I’m nearing the end of the weaving phase. Your video for the clew isn’t available, would you mind re-posting it? Thanks! I did an illustration and I’ll post it to this entry. Hey! were you ever able to get any illustrations? I read in the comments you used mason line. I wonder, to cut down cost, could you use all nylon #18 mason line? I also tried Yarn Barn in Kansas, but WOW! talk about confusing. I even called and asked. they were talking to me about epi, and the sett. They were speaking in an alien language. I even did extensive research on what mm a #18 nylon thread was. I found .5mm. But I have no idea where to find the cotton equivalent. The woman at Yarn Barn did say that she thinks the closest would be 8/2. I may get it, and if its too thin resell it. Also, I’m not really understanding how much of what I should get. (Maybe it was YB of KS clouding my mind!!) I understand I need 2,000 yards of yarn, or string. But thats in total, right? So, how much of the mason line, (assuming you used it for the warp) do we need. What do you use for the clew, and how much of that? Then, of course, the colored yarn, is that 1,000 yards alone? You could do the whole thing in mason line. My first was like that. I also got confused when I spoke with the yarn barn. That length looks about right. You may need a little more for the clews. How do you go back from the other side, to the beginning side? You wrap around the pole and begin a new weave using the same pattern. Hi Derek, I’ve got one question about this project. Can you make more than 2 weaves in every spaced section to make your hammock weave “tighter”? Or are there any other methods to tighten the hammock and make the holes smaller? You could crochet it. This is a technique done in Merda to make smaller knit. I’m sorry, I don’t quite understand, you mean like with crochet hook? But how will you weave the triple weave then? Sorry. I’m not 100% sure how they are crocheted or if a triple weave is used when it is crocheted. I’ll have to do more research. On my first practice hammock I did a very tight weave. Us a thicker string. That looks great! Fantastic find! It wasn’t my video and it looks like whoever posted it took it down. I really need to make my own video. Just adding my voice to encourage you to make a how-to video for the clew. Love your website! Thank you so much for the informations, I want to make my own mayan hammock this summer and it is not easy to find how to do it ! When you load the loom or when you change string for the color, which kind of knot do you do ? This is a point I don’t really understand. And when you finish the hammock, how do you stop strings ? About strings, do you use cotton, nylon or both ? Maybe strings around the loom in nylon and cotton strings for the weaves, what do you think ? And last question, do you know where I can find cotton strings in so much quantity ? I am french, so maybe you don’t know French stores, but do you know website who could send me rope in France ? I hope you could answer to me. Anyway, thank you so much for your instructions ! If it is easier for you to answer me, here my email address : bonneau.cecile72@orange.fr ! Good questions! When I’ve done multi-colored or alternating colors I usually have netting needles of each color attached even when they aren’t the current weaving color. 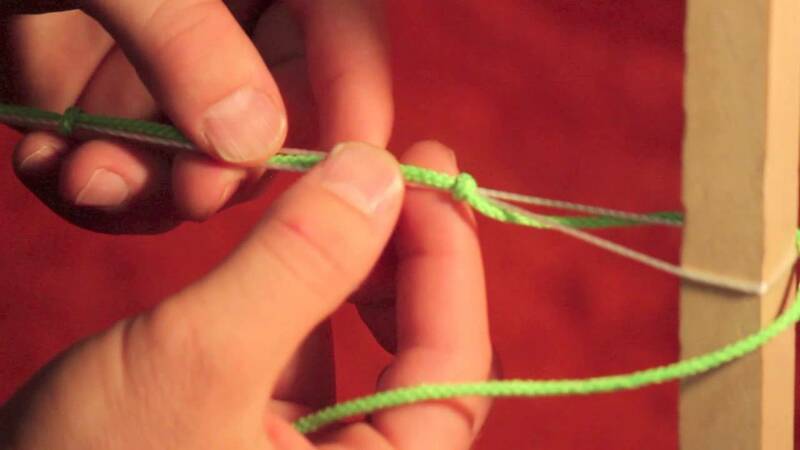 When any color runs out or when I need to change (or switch colors if only using one needle) I tie either a double fisherman knot, a square knot, or sheet bend. You can use any number of strings. Many hammocks use cotton for the bed and nylon for the clew nettles but you can do either. I only recommend you don’t mix fibers in the bed and clew. The weavers I’ve spoken with in South America refer to string by weight. A typical hammock uses about 2kg of string. The Yarn Barn in Kansas was another place I sourced string and they use an entirely different system. Honestly, I am not knowledgeable enough to give much help on sourcing the string outside of the example I used in this post. The twisted #18 mason line seemed to be the right thickness I was after but you can go thinner or thicker. I have several you can buy. Send me an email. That looks pretty good. Hard to tell how thick the string is. Thicker is better. I’m interested in making a hammock chair using this tighter triple weave as opposed to a single-woven hammock or a knotted macrame one. Am I right in thinking that this adjustment could be made by shortening the strings on one side of the clews more than the other? Other than that, do you know of any other adjustments that would need to be made to make this into a hammock chair? Obviously the proportions of the bed would still need to match the intended orientation. Thanks for a great tutorial! Thanks. Yes just adjust the size of the seat. ThanQ very much for the useful insights and information, I couldn find the right size of nylon string, only thin yarn, any idea what is it originally used for if not for hammocks? to look for it in the right section/market! Also when I tried with the available nylon size it was hard to tell how tight or lose the lines should be, any advice? Thank you for your support! I wish I had better answers for you. I have had the hardest time finding inexpensive string to weave these hammocks. If I had more time, I would spend it working with the great folks over at the Yarn Barn. They can send you samples and you can see what works best for you. Or, if you have a sample from a hammock, you could send it to them and they could do a much better job at recommending a thread than I. With all the material ready, what is the total time frame it takes from start to finish? That is really difficult to say because it’s all about how accomplished, accurate, and fast you are as a weaver. I found for myself that I was much slower at first. I could get into my paces and get an inch every few minutes. Still not as fast as practiced hands. From what I’ve read, an accomplished weaver can complete a full hammock in about a week, when working full time. It took me a few months to get mine wrapped up, but I was only working on it for a few hours a week, and I was also a beginner. It is also very much depending how wide your hammock should be. Also the thicker the thread the faster you finish. Mexican producers told me that the range can be from 30 hours to 80 hours (4 m long, 3 m wide, 0.9 mm thread) per hammock. Hi! I’m wondering if you could do a tutorial on how to fix a mayan hammock. Mine somehow got a hole in it and I have no idea where to start! I am hoping to embark on making my first Mayan Hammock – your blog really inspired me to have a go! I can’t seem to find cotton sold in the sizing #18 as you describe and have tried to find a converter for size #18 cotton and came across the ‘0.5mm’ answer. Is this correct? I am from Australia and am finding it quite hard to source the cotton required for the job. Also, I have discovered that this project is quite costly (reels of bulk cotton are quite expensive!) but of course worth the effort I would say! I would like to make my hammock out of a reliable and sturdy cotton and have found that some cottons are just a ‘one twist’ type thing and they seem to be not overly durable. Do you recommend any cotton in particular? I have looked at 3mm cotton sash cord. This is probably much thicker than the cord which you work with but I was wondering if the weave would still work with this thickness of cord? Also, would I still need a very long length – it being a thicker cord and working up faster? (The cotton sash cord I have found is 3mm @ 320m for $127 – so I’m not wanting to buy 2000m of it!) I suppose this is all very hypothetical from your end. Is 2000m the approximate length for the total amount of cord required for the Mayan Hammock you describe? If so, I really need to find a good and well-priced distributor of bulk cotton, solidly made, which is (perhaps) 0.5mm thick. Oh and preferably, coloured. Any ideas? Any feedback in regards to my questions would be greatly appreciated! @Terayz, unless you can source the cotton string at a good price, weaving your own hammock can be costly. It was really hard for me to find string as well because of the markup. I did ask a hammock shop in Mexico (hammocksrada.com) to sell me authentic string, but it cost more than their finished hammock! It was crazy! They sold their string by weight, and it was 2 kg total. I’m not sure that equates to 2 km of yarn! Maybe I need to double-check my arithmetic, but it does take a lot of string. I’m not a yarn / string expert, so I reached out to the Kansas Yarn Barn and sent them samples for them to get me sizes. It was still confusing because they used a different measurement than inches or centimeters. I hate that I can’t be more helpful, but I hope that this gives you some direction where to ask the next question. Maybe reaching out to Hammocks Rada or a yarn barn can help you find the right string size at a good price. The actual weaving is the fun part! I enjoyed making the weave by hand and getting into a rhythm. It’s very therapeutic. Thanks for your reply. Yes, it certainly is a pricey thing to make and totally ridiculous that a pre-made hammock is cheaper than buying the cotton to make one yourself. Finding the cotton cord seems harder than making the actual project! I think I may have found a source for my cotton – but at the moment I am still checking sizes, length, etc to see if I am on the right track. It seems that ‘extra thick cotton seine twine tex50 x 6 x 3 12/18 500grams per 500 metres’ is the way to go. This would make sense as 2kg of cord would equal roughly 2000m. This is what you seemed to indicate. From all online sources I have looked at, I gather that this is quite a durable cotton twine and should hold up to ‘being a hammock’. Even though the cord is fine by itself, once woven I hope that it will be strong enough. If you have any feedback or tips regarding making your own cotton hammock that would be handy. Finding things out online, without actually seeing the cotton first-hand to know what I’m dealing with, is quite the challenge. I can’t wait to weave myself, and hope that it is as straightforward as your blog seems to indicate. Therapeutic indeed! Excellent. The thick cord I have found at $127 for a 320m spool is 6mm not 3mm thick. I thought there was a 3mm spool, but apparently not.